And for all of you wondering - traveling to Cuba was an absolute breeze. The visa situation was straightforward (my visa was for "journalistic" purposes - I mean, writing on my blog counts, right? ), and way less intense than it seems - we got zero questions about our visa the whole time. We also probably did a total of only 1 hour planning prior to our trip, and only booked a hostel only for our first 3 nights. 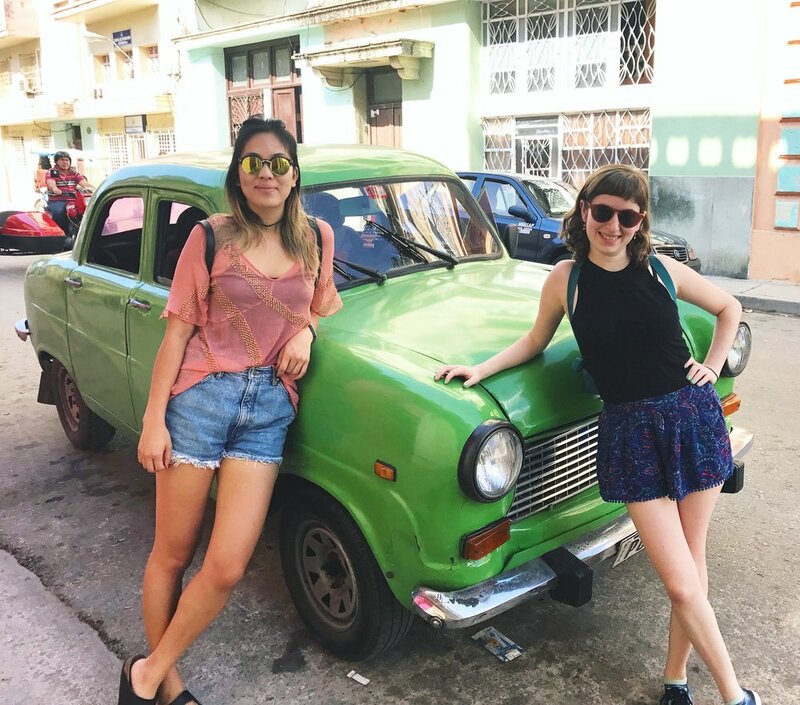 With a lot of informal tourist infrastructure, Cuba's the kind of place where "winging it" is expected (and favorable), and if you have no shame in carrying a guidebook with you the whole time (like us), it's a lot more fun and stress-free to play it by ear! Emily and I landed in Havana for the first 3 days of our week-long trip. The first thing we and other tourists notice are the old cars - no matter how much you are told or read about them, the classic American cars are still a novelty that doesn't wear off. I probably have at least 100 photos of old Chevys, Fords, and Bel-Airs from the 50s - so thank me for sparing you all of them! And, just like many other things that were fascinating about Cuba - its architecture, the cities, the ways of life - Cuba's old cars are a reflection of its history, its moments of relative prosperity followed by rapid depression, and, of course, tenuous relations with the US. Many of the buildings in Havana, while clearly grandiose in design, looked abandoned and desolate from the outside. Many of them, however, were homes to large families, mansions turned hostels, and restaurants. Havana was a fun, bustling city. Every street was a river of rambling pedestrians, pedi-cabs ringing their bells at the pedestrians in their way, and classic-cars-turned-taxis honking at the pedi-cabs. More so than in other cities I've visited, the streets were a place to hang out, locals sat on chairs people-watching or playing games, and many homes left windows and doors wide open, removing the barrier between public and private happenings. As something I saw in every town we went, this became one of the things I associate most with Cuban culture. That, and, of course, paintings of Cuban heroes and icons. We saw a number of graffitied portraits of and tributes to Fidel Castro and Che Guevara, who played major parts in the Cuban Revolution. Most of my and Emily's time in Havana was spent walking from restaurant to restaurant. We had a long list of rooftop bars and restaurants we wanted to try and were fortunate to see so much of the city by foot. Only five days prior I was sitting in an office in San Francisco, so I was excited to be walking around all day, with no internet or cell service, in a place I'd never been, with a beloved friend! Click through the gallery below for more pictures of Havana (and Emily), and check out my other blog post on Trinidad, El Nicho, and Cienfuegos!